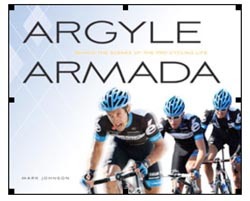 A new book, Argyle Armada: Behind the Scenes of the Pro Cycling Life delivers an unprecedented look inside the sport and lifestyle of professional cycling. Embedded with Team Garmin-Cervélo for its 2011 season, writer-photographer Mark Johnson brilliantly chronicles the team's most intimate personal dramas and public celebrations. From winter training camp on the cobbled lanes of medieval Girona, Spain, to hard-earned stage victories in July's Tour de France, to flesh-shredding crashes at the Vuelta a España in September, Argyle Armada brings the life and work of a pro cycling team into focus through incisive writing and spectacular color photographs. The book is now available in bookstores and bike shops and online. Learn more and download a preview chapter of the book at argylearmadabook.com. More than a book about racing, Argyle Armada is a portrait of life as a member of a pro cycling team during a time of painful transition for the sport. Johnson unveils the dramatic forces that Garmin-Cervélo must navigate as team founder Jonathan Vaughters tries to push forward his vision of a reformed sport. Along the way, countless difficult decisions must be made to keep the team competitive in the chase for ProTour points, money, respect, and fame. With all-access insight and spectacular color images, Argyle Armada is a backstage pass to the world of professional cycling. Hardcover with jacket. Full-color photographs throughout. Mark Johnson has covered cycling as a writer and photographer for national and international publications since the 1980s. His work has been published in cycling magazines including VeloNews in the United States, Cycling Weekly in the UK, Velo in France, and Ride Cycling Review in Australia as well as general-interest publications including the Wall Street Journal and the San Diego Union-Tribune. A Category II road cyclist, Mark has also bicycled across the United States twice and completed an Ironman® triathlon. He has a PhD in English literature from Boston University and has worked as a freelance writer and photographer for the Slipstream Sports cycling team since 2007. His other passion is surfing, which he does frequently from his home in Del Mar, California. To sell this book in your store, please email wholesale@competitorgroup.com.